I experimented with two recipes this week: One entirely grain free (using blanched almond flour) and one made gluten free by substituting a gluten-free flour mix for regular flour. The winner — hands down, I might add — is the one made with almond flour and a little coconut flour. 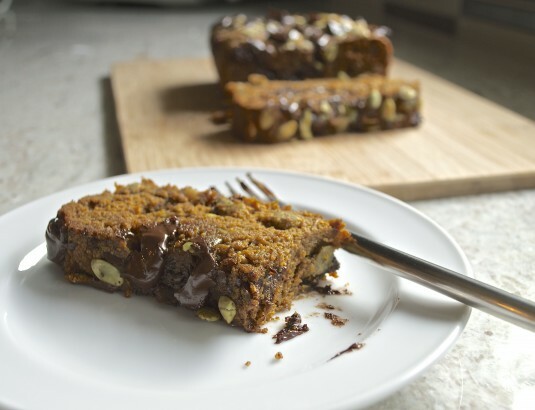 Yes, Paleo baking….we’re back. Now, I haven’t done extensive testing of pre-packaged gluten-free flours but I’ve gotta say I haven’t been thrilled with any of the results. With my trip to Montreal still fresh, I’m inclined to dust off my French and say there’s a certain je ne sais quoi about GF flours that I don’t like. Except I know what the problem is: A lingering gritty texture, from (I suspect) bean and/or buckwheat flours often used to make a GF all-purpose blend. Bleech. Almond flour to the rescue! I’m very glad I’m not allergic to nuts because blanched almond flour is what makes grain-free/Paleo baking worthwhile for me. No grit = happy recipe tasters. 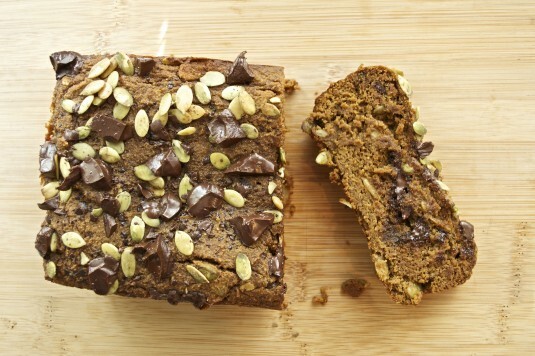 So now I’ve got my pumpkin spice fix in a moist, spicy loaf with some crunch from pumpkin seeds and melty bittersweet chocolate bits. Aaaah, fall. Bring on the grey days and pouring rain. I’ll be warm inside, cozied up next to the fire with a (homemade) latte and a slice of pumpkin spice heaven. 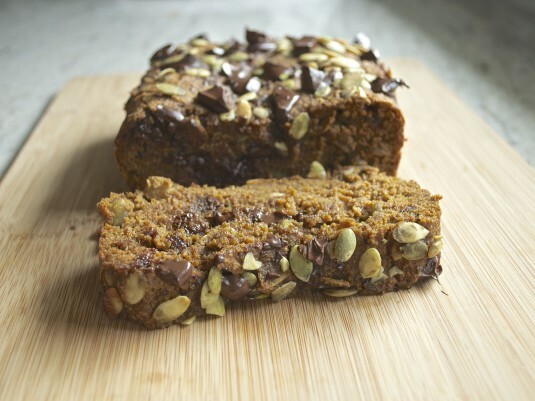 This is a moist, grain-free loaf that brings a taste of pumpkin spice to your fall. Great with a morning or afternoon coffee. To keep it more Paleo-ish, use coconut oil and coconut palm sugar. Preheat oven to 350F. Spray loaf pan with non-stick spray, then line with two parchment strips. Combine butter and palm sugar in a large mixing bowl and beat on medium speed until smooth. Add eggs, one at a time, to the mixing bowl, beating well after each egg is added. Mix in pumpkin puree and vanilla and beat until smooth. The batter will be very wet -- don't worry about this, as the coconut flour absorbs a fair amount of the liquid. 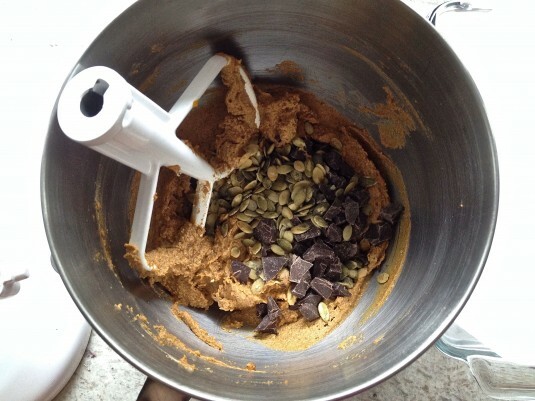 Add all dry ingredients at once (everything except the pumpkin seeds and chocolate) and mix until smooth. When smooth, beat on medium-high speed for a minute to get lots of air incorporated into the batter. Stir in the pumpkin seeds and chocolate chunks -- all but the reserved amount for the topping -- and mix until evenly distributed. Pour the batter into the prepared loaf pan and smooth the top. Sprinkle the reserved pumpkin seeds and chocolate chunks on top. Bake for 45-55 minutes, or until a cake tester inserted into the center comes out clean. Remove from oven and let cool 5-8 minutes in the pan. Using the parchment strips, lift the loaf from the pan and let cool completely on a rack before slicing. Coconut palm sugar is made from the sap of cut flower buds from coconut palm trees. It apparently has a lower glycemic index rating than other sugars, and some Paleos allow it in their diet. Brown sugar would be an acceptable (though not Paleo) substitute. All of your recipes look amazing!!!! Would love to try this one, but one of my daughters has a severe nut allergy. Can I substitute Cup4Cup or Bob’s Red Mill for the almond flour? 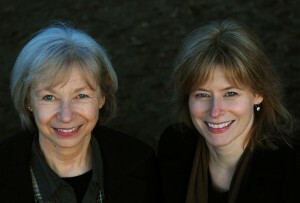 Thanks for your help!!! Thanks for your kind words, Deborah! Yes, a gluten-free flour substituted for the almond and coconut flours will work just fine here. I’ve had very good luck with Cup4Cup in my baked goods. Let me know if you try the recipe out. Thanks again!